While this was a regularly scheduled SPS activity led by others, I was to be appointed trail leader as a courtesy, since I was the author of the local peaks guide. The group was to climb Round Top, Freel, and Pyramid over this holiday weekend. Being such a short drive for me, this was a change from the longer drives, traveling with huge holiday crowds. To earn a SPS Senior Emblem, one leader needed Round Top. Their plan was to do two peaks in one day. The 6 a.m. meeting time at Carson Pass was a bit too early for me. I arranged to meet them for their second peak, Freel, at the USFS road junction south of Luther Pass. I drove up to meet them at about 10 a.m. I had plenty of magazines and catalogues to read. I waited. Finally, at 12:30 p.m., they appeared. I led the cars up the main dirt road, to the side road, 0151F. Parking, one hiker chose to read a Harry Potter novel. Guiding, by 1:28 p.m., the rest up to the Tahoe Rim Trail, we made good time. The official leader, Dan, who had done 9 miles with 1,900' gain already, lagged a bit. We followed the well-graded Tahoe Rim Trail to "Freel Col," where we rested. Mountain bikers pumped up to this point. A side, use trail went up from here all the way to the top. One climber was too eager, getting ahead and then off-trail. I topped out at 4:31 p.m. The rest were up in minutes. The two register books were full. I placed another. This was my 9X. We took pictures. Leaving the top at 5:08 p.m., I took the group, cross-country, down the south side of the mountain. 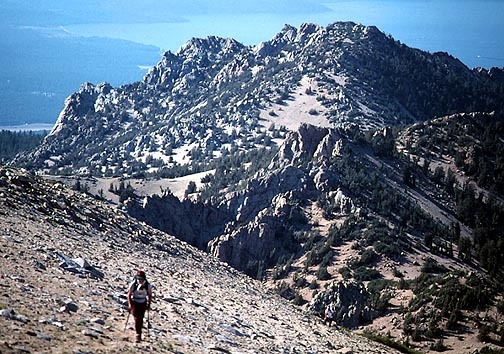 Sand and scree allows for a run, descending a thousand feet in minutes. Hitting the main dirt road, we were back to the cars in less than an hour. Not being inclined to camp and do another peak, I left the group to go home. Having a leisurely dinner at Pollock Pines, I was home at a decent hour. The stats on this day, for me, were 5.5 miles with 2,400 feet gain.